Whether you’re part of a small, family-run service provider, a global conglomerate – or something in between – a trusted and able workforce is among your most valuable assets. Fumble it, and you miss tapping into that employee’s full potential. Onboarding is more than simply signing legal papers and receiving training to physically to the job. Onboarding is about nurturing your new hire so they adjust to their new surroundings, get a feel for the company, new co-workers and acclimate to their new position so that when they begin the nuts and bolts of the job, they are able to do it with confidence. 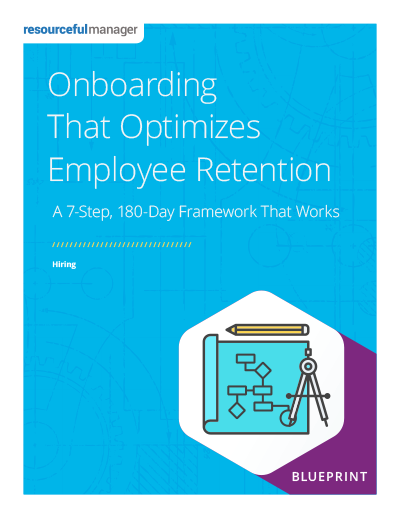 The more specific you tailor your onboarding process, the more likely you’ll leave no stone unturned in training and integrate new employees into the company fold. The key to onboarding is to develop an experience that doesn’t take too long but also isn’t so brief that it leaves your new hire foundering. ResourcefulManager's "The Right Way To Conduct Salary Talks" Blueprint comes with an unconditional, 100% money back guarantee. If you decide "Difficult Conversations With Employees " Blueprint doesn't deliver value or simply isn't your cup of tea, just email us at contact@resourcefulmanager.com within 90 days, and we'll process your complete, no-hassle refund in 1 business day or less.